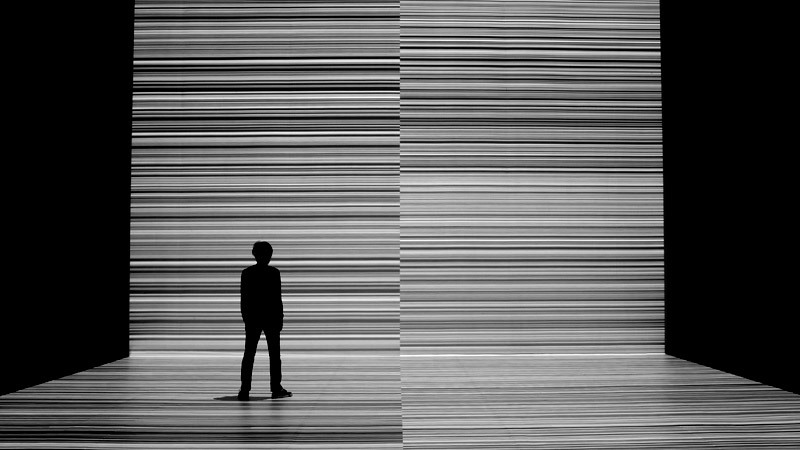 We may not be able to predict what The Singularity will look like, but I’d like to think it’s something like Ryoji Ikeda’s “The Transfinite.” Today’s your last chance to see Ikeda’s large scale audio-video installation at the Park Avenue Armory where the purity of math becomes poetic. Once you step into the massive hall, you’re flooded with a pulsating projection of black and white strips that race across the floor and onto a massive projection screen. The movement of the linear graphics is synchronized to an electronic soundtrack, composed by Ikeda, that reflects a real-time binary analysis of the music notes. It’s a fascinating play of light and sound, which creates unique experiences from different vantage points. Stepping behind the projection screen, there are two more installations based on the controlled visualization of vast amounts of data – from the human genome sequence to the astronomical coordinates of the universe. It’s a dynamic introduction to the world of binary code and one of the most incredible sensory experiences I’ve ever had in New York. Check out this video for a taste.